Henry enjoyed a love-filled life with his foster family after his tumor was removed. He passed away earlier this year. As part of her sentence, Haughton will never again be allowed to own, care for or live with an animal. Back in June of 2016, we told you about Henry, a lovely golden retriever who’d been abandoned in Newport Beach, CA. Henry was lugging a shocking, 42-pound tumor around with him. Many people contributed donations to help Henry get the surgery necessary to make his life happier and healthier. We’re happy to bring you yet another update: Haughton has officially been prohibited from owning, caring for or living with an animal. Henry before surgery (left), a happy post-surgery Henry with a Newport Beach Animal Control Officer. The L.A. Times reported that this week, Haughton pleaded guilty to misdemeanor charges of animal abandonment and failing to care for an animal. 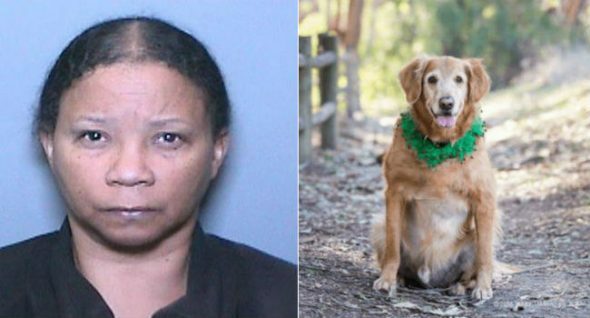 She also must attend a 16-week animal neglect prevention program, perform 56 hours of community service and repay more than $7,000 spent on the dog’s care. Haughton initially lied about Henry; she told shelter employees that she had found him on the beach. 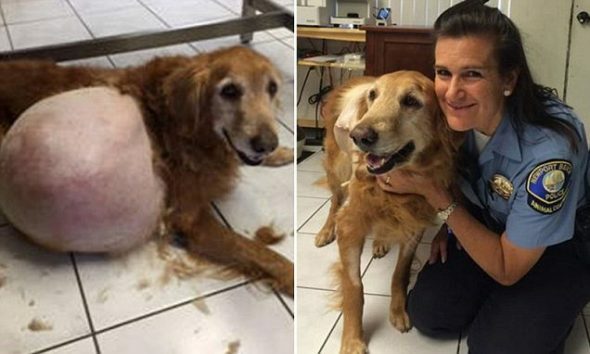 After his tumor was removed, Henry became a typical golden retriever — quite full of energy. He was later adopted by a foster family and underwent radiation treatment for cancer. He was a happy dog, who loved running and playing. Sadly, he succumbed to cancer earlier this year. He was 8. Dog Loves The New Snow Booties!